When did your business launch? Unofficially in 2004 when I was a little college student doing what I could to make extra money here and here. I was a home sewer. More officially Doing Business As Heartbreaker Fashion in January of 2006. We had to change our name at the beginning of 2014 because of a legal dispute with another apparel company who trade marked the name, Heartbreaker, back in 1992. They waited a long time to defend their trademark, but in the eyes of the law, they have full rights to it, so we had to change. What is your business about? What is it that you do/sell? 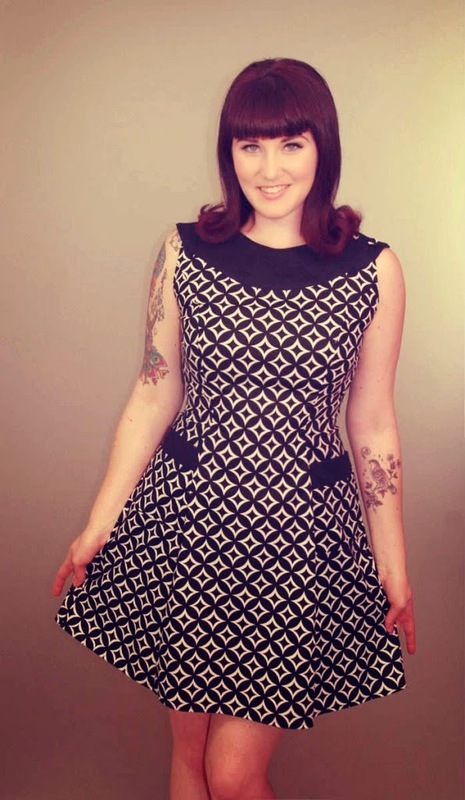 Heart of Haute is a vintage inspired apparel company with an eye on the mid-century. 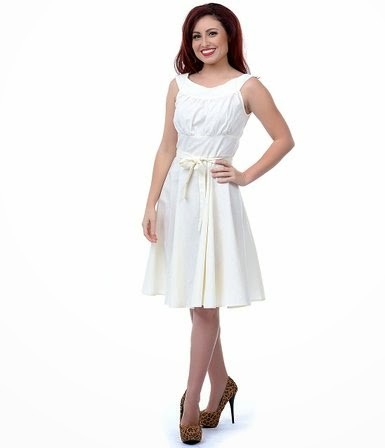 We sell mostly ladie's dresses, blouses, and skirts with a few accessories and shoes from other companies. We design and manufacture our garments locally and ethically in California and swear we will never take our production outside of the US. It's that important to us! What gave your the inspiration or motivation for your business?Fashion. Like many 19 year old girls, I liked clothes. I wanted to be stylin' everyday. I've always had an entrepreneurial spirit since I was young. I remember being 10 years old and planning out a coffee shop/venue type of business. I was the kid that ran the lemonade stand in the neighborhood and put the other kids to work. I decided from early on I wanted to be my own boss, so I use my creative talents as my building tools. Do you do this full time/part time?This is my full-time job. I also started teaching Yoga in the evenings and I play in a band a few times a month. How has your life changed since starting your business? When I started making Heartbreaker dresses, I was working at Mervyn's as a cashier part-time and going to school. I started my company when I was a sophomore in College, I was about 20 years old. By the time I was 21, I was able to leave my sales job because we were generating enough money for me to get by and there was promise for growth in our business. And it did grow! Bigger than I ever imagined. I was studying music in College and I didn't have a lot of direction at the time. I was assuming I would make a living in performance and education like most Music majors do. Starting this fashion business took me down a much different, but direct path of success in my 20's. What is the biggest obstacle you have encountered? Balancing my passions with my duties. What is something you thought was going to be hard, but turned out to be simple, in regards to your business? There's a few things. The first I challenge I remember having was finding professional models to work with us for cheap or for free. At the time, Bernie Dexter was incredibly popular and helping a few other companies in our niche market. I thought "She would never model for us" or "I'm sure she charges a ton". I was really worried, but I decided to just send her an e-mail to inquire. In our first e-mail exchange, she offered to model for trade. I was seriously THRILLED. The months and years after that, we had a great relationship with Bernie and her celebrity helped boost our company. The lesson I learned from this was that it never hurts to ask. The worst anything someone can say is "no", but I found more often than not, most people want to collaborate and help one another. The next challenge recently had to do with our name change. The people demanding we change were not very friendly or kind about it, so it was upsetting to deal with. It at first affected our business greatly because the majority of our work is done online. Changing our name lost some accounts and customers and our web analytics dropped drastically. We thought it was going to kill our business completely. Luckily, that's not what happened. We just kept on doing what we do best. I kept my logo and just changed the name. Some people hardly noticed. Some people still call us by our old name and others are embracing the new one. In the end, it's just a name. I really believe the product and the service we provide is more outstanding than the name itself. I think my customers appreciate the personal responses from my staff and I- yes, I do customer service, too!!! Lesson from this story? Just be positive and D.L.T.B.G.Y.D. I think about the history of this company often. I remember my sleepless nights of sewing and cursing at my crooked zippers. I look at old photos of myself wearing our dresses and thinking how far we've come. The zippers are no longer crooked- don't worry. There was one year at Viva Las Vegas a girl was wearing one of my first designs that I made and sold on eBay back in 2004 and I freaked out!!! I mean- no one else could possibly have a dress like this and I had to ask her about it. She said she had been following me and my blog from the start and was always shopping out our new site. That was endearing. Seeing girls actually wear our garments out to events. That's the biggest success, I think. Our biggest success in terms of business, though was Tripling our business in 2010 - 2011. We grew to 24 employees in the course of a year and took on great accounts including ModCloth.com. We sell to specialty boutiques all over the world, including TONS in Australia, Canada and in Europe. Do you have any big plans/ideas/launches planned for 2015? What would you like to share with COAST readers about your company/business? Lastly, what is the advice you would give to someone looking to start a company or business similar to yours? The first thing I find important is believing in your product. Make something of quality that your customer can appreciate. After all, your product is what makes your money, which pays for you to live. You get what you put out. If you make items that are sub-par, you'll be paid accordingly. Always be kind to the people you work and collaborate with. There's a lot of drama, cliques, and gossip in fashion. It's best to keep to yourself and focus on your work than participate in the drama- even if you're the subject of the gossip. If you don't break even or make a profit in your first year, statistics prove that you'll fail. I don't mean to be a downer, but it's typically true. Unless you have some crazy rich uncle that wants to pour money into your dreams, my best advice is to start small and slow. If you have a good product and market it well, it will sell. Networking!!!! Especially in this niche market place, it's good to trade products, photos, fans, etc... because it will get your product in the eyes of other potential customers that are already into that style and you'll grow your friend-base, too. I also think Etsy is a great place to incubate any new project. Listings are only 15 cents and they take a small percentage when your item sells, so the risk of losing money is very, very low. You can build an audience with social media and direct your customers to your Etsy page. Yay! I *LOVE* Heart of Haute and Mandie Bee!